Metro is a beautiful design style. Metroblog combines that with your everyday blogging experience to give your readers the most elegant and simple viewing experience ever. 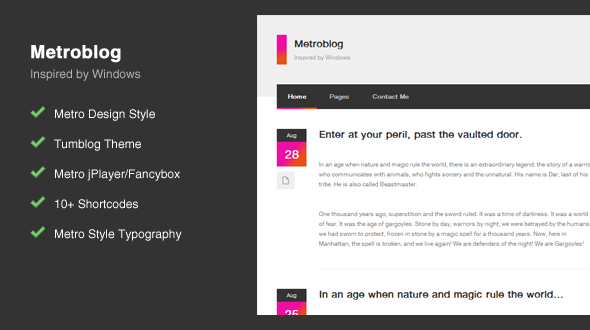 Metroblog comes with a few awesome features. Standard, Link, Quote, Image, Gallery, Video, Audio, and Aside. Tabs, buttons, toggles, and more. Custom Metro style skins for jPlayer and Fancybox. Custom Twitter and Flickr sidebar widgets. Metroblog also uses a special CSS3 class called gradient that lets you add the signature Metro gradient to virtually any element in the theme. Allowing for even more personalization!